Go shopping this time of year and what will you find? Lots of stripes, anchor patterns, and sail boats. It’s almost like everyone is expected to jump on the nearest boat and become a sailor just because it’s gotten hot outside. I’M JUST REALLY OVER IT GUYS. However, I have to admit: the preppy style wins me over every Summer. Along with working the quirky patterns and bright, sunny hues into my wardrobe, I love introducing these elements into my home – and I especially love different takes on the preppy style. It doesn’t always have to be nautical! Really, the key to getting preppy decor down is just this: combine bold, large-scale patterns, a fun color palette, + touches of your own personal style. So, how can you bring this tailored aesthetic into your home? We’ve put together a set of rooms that take preppy interior design into fun and sometimes unexpected directions. Let’s take a look. Let’s get this one out of the way first. The most straightforward way of doing the prep look is to layer with bold plaids and stripes. With this combination of patterns, you’ll mostly want to play with neutrals to keep the look under control. But make sure to choose one area that you’d like to have a a bright pop of color, like the red pillows and duvet shown in this lovely plaid space. Take your preppy style in a Ralph Lauren direction with lots of Chinoiserie patterns. What really gives this space its impact is the repetition of the motif throughout. Strong wallpaper and a mixture of decorative vases work with a mostly monochromatic color scheme and an oriental rug to nail down the look. Go for a Kate Spade-inspired space by combining a light-hearted wallpaper with glamorous gold touches and a pop of rich, jade green. This preppy space is elevated by flourishes of unexpected, quirky elements. Check out the cute tiger towels. And what are those sconces? Golden snakes?!! I’m here for all of it!!!!!!!!!!!!! Maybe you want to do the preppy look in an understated way. Since animal motifs and wall paper are the staples of a preppy style, just take those elements and pair them down a bit for a minimal look. This lovely gray and gold elephant wallpaper with bar cart and fresh stems strikes a simple and elegant tone. Maybe you prefer a super layered look. Preppy interior style can lend itself to this, as well. Here, a saturated blue, geometric wallpaper is the perfect backdrop for an eclectic mix of frames and other hung objects. When used in a room with similar layering throughout in furnishings and fabrics, you can achieve a maximalist environment that feels wonderfully curated. Pinks and greens are go-to hues for a preppy style. We’re calling this one Palm Beach Prep for its use of dramatic drapery, tufted seating, and traditional forms in a mixture of patterns and saturated tones. All of it comes together to a space that screams luxury. Again with the wall paper! Here, the preppy style goes safari with a large-scale zebra print, grass cloth shade, and touches of nature. How fun would it be to have a powder bath like this in your home?! Another way to do the preppy style with a warm weather concept is to mix patterns with fun decorative pillows. Tropical leaves, animal print, and perfectly pink florals layered together evoke that calm, casual feeling of Summer. Finally, this is a great look if you happen to have a dark yet humorous side. Take preppy interior style in a moody direction by pairing the familiar large-scale animal prints with a blend of deep, contemplative colors. This look is for the odd birds. So, see? There are a bunch of ways to achieve a preppy interior look that stays true to YOU. No sailboats here. 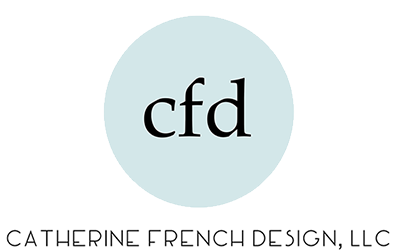 If you’re up for revamping a room or two in your home, shoot us an email at hello@catfrenchdesign.com and let’s get you styled for Summer!